Minsk consistently avoids supporting Moscow in Ukraine and Syria. To put it mildly. 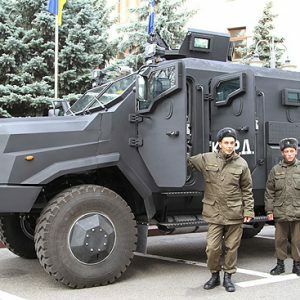 After all, on 7 December, Ukrainian Internal Minister Avakov inaugurated the new Ukrainian armoured vehicle Varta designed in cooperation with "Belarusian engineers". It became just one more of a series of examples of Belarus-Ukrainian defence cooperation. Later on, the Belarusian Defence Ministry denied claims that it supported Russia's position in the latter's dispute with Turkey. Belarus risks estranging its Russian ally, but not because it wants to earn extra money in Ukraine or from conservative Arab regimes. Minsk strives to improve relations with Russia's opponents because the Kremlin has shown itself willing to make radical foreign policy moves. Last week, Russian propaganda outlet Eurasia Daily published a commentary with the eloquent title "Belarusian 'Neutrality' is Hypocrisy on Spilled Blood." It summarised a series of articles in which experts close to the Kremlin accused Belarus of anti-Russian policies in Ukraine and Syria. When prominent Russian experts criticise Minsk in half a dozen articles on Eurasia Daily it means that the Kremlin wants its Belarusian partner to understand the seriousness of the accusations. The leading expert on Belarus at the Institute for Studies of CIS Countries, Alexander Fadeev, pointed out that Belarus supplied Ukraine with fuel, dual-use goods and components for arms systems. He emphasised that Minsk did it not only for economic but also political reasons: in other words, to improve relations with the West. On 11 December, a Russian political analyst working at the prestigious Higher School of Economics called Andrei Suzdaltsev developed this idea further. According to him, Lukashenka not only earns money in Ukraine but also says to the West: “I am yours, don't stage a Maidan in Belarus”. Ridiculous accusations of Belarus selling weapons to ISIS will not fool anybody. In fact, it is Belarusian policy in Ukraine and not Syria which enrages Moscow. And evidence of Belarus-Ukrainian cooperation abounds. A year ago it seemed that Belarus might merely take advantage of the situation to earn some money supplying Ukraine with war materials. Now, almost two years into the Donbas war, Minsk continues to cooperate with Kyiv, proving that this collaboration is part of Belarus' longer-term strategy in the region. Kyiv-based journalist Ihor Tyshkevich has recently published in Khvylia a new investigative overview of Belarus-Ukrainian cooperation. He believes that this year Belarusian firms could earn about $90-$100m from military-relevant deals (without fuel) in Ukraine. Something of this business is evident, like the rise of Belarus' share in the Ukrainian aircraft fuel market from 0% before the war to 45%, or statistical data on bilateral trade which show transfers of numerous goods for probable military use. Indeed, while in 2014 Belarus sold Ukraine $5m worth of aircraft, in the first half of 2015 this figure rose to $14.4m. In 2015, Kyiv bought from Belarus special trucks worth $1.7m, i.e., the respective export rose by 210% compared with 2014. Many possible indicators of cooperation lack direct evidence, yet look convincing. For example, Tyshkevich points out that the Ukrainian army has started to receive large quantities of the new anti-tank missile system Stugna. Ukraine produces only the missile used in this system, while the rest is delivered by Minsk-based firm Peleng. The statistics show that though Belarus has earned some money from these transactions, this alone is not enough to be worth the risks which these Ukrainian deals pose to Belarus-Russian relations. Minsk is not looking for money. The Russian experts quoted above got it right: politics determines the behaviour of Belarusian government. First of all, Minsk strives to maintain and improve relations with opponents of Moscow in the region and beyond (first of all the EU) because the developments in Crimea and the Donbas have profoundly shocked it. 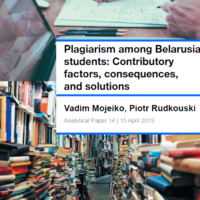 It is not sure that something of this kind could not happen in Belarus and is looking everywhere for partners who would help prevent or, if necessary resist, such an eventuality. At the same time, Belarus has reached the limits of its cooperation with Russia as set by the Kremlin. In the field of military industrial cooperation, Minsk has suffered numerous disappointments. For instance, its plans to establish jointly with Russia an assembly production of aircraft in Belarus in the early 2010s ended with nothing. Earlier, in the late 2000s, Belarus negotiated with the Kremlin even more far-reaching plans for producing top defence products in Belarus. Among them were short-range ballistic missile systems (Iskander), surface-to-air missile systems (Tor) and launchers for mobile intercontinental ballistic missile (Topol). To no avail, too. For some of these opportunities Minsk then publicly turned to China, and more discreetly to Ukraine, especially after Crimea. Interestingly, the Belarusian general Piatro Rahazheuski who had negotiated with Moscow possible Belarusian participation in producing Iskanders and Tors later on opted to work with Ukrainians. This former Deputy Defence Minister of Belarus and later Deputy Chairman of the State Military Industrial Committee is now the director of the Belarusian office of the Ukrainian Motor Sich Company. Motor Sich has given Belarus something Russia denied: the Ukrainian company established a helicopters repair facility in Orsha and plans to extend it. Tyshkevich asserts that Ukraine helps Belarus with expertise and technology, not only concerning aviation but also tanks and missiles. Russian scholar Suzdaltsev on Eurasia Daily agrees: "Lukashenka is trying to get from Ukraine the arms which Russia – taking into account the not very trusting relations between Minsk and Moscow – cannot give him." Tyshkevich and Suzdaltsev assume that Ukrainians might have participated in designing the Belarusian Palanez multiple launch rocket system. Officially a Belarus-Chinese product, Palanez shoots further than the Chinese WS-2 and WS-3 systems which presumably served as prototypes for Palanez. Since its first public demonstration in May, the media have speculated about Ukrainian (and Russian) involvement in designing this weapon. All in all, Belarus' contacts with the Ukrainian and Arab regimes opposing Russia cannot be dismissed as the opportunistic pursuit of easy money. Minsk dislikes the policies of the current Russian government which threaten to redraw international borders. Moreover, it has realised that the Kremlin takes its alliance with Belarus for granted and does not deal with it as a partner. Despite his regained ability to travel to Europe, President Alexander Lukashenka’s 'social circle' has so far remained limited to leaders of countries that have difficulties in their relations with Western democracies. In the past month, the Belarusian president has become his country’s most diligent diplomat. He welcomed his Serbian and Azerbaijani counterparts in Minsk and travelled to Vietnam and Turkmenistan on official visits, focusing on trade and investment but also working on reinforcing political ties. However, he had to postpone his most important foreign trip – to Moscow to meet Vladimir Putin – due to the two countries’ disagreements over relations with Turkey and the Russian air base in Belarus. On 18 – 20 November, Serbian president Tomislav Nikolic visited Belarus on an official visit. According to his Belarusian counterpart, Serbia remains Belarus’ 'key trade and economic partner in the Balkans'. Trade and investment issues dominated the bilateral agenda. Trade has been growing steadily since 2009 and reached $245m in 2014. However, the two countries are unlikely to reach their declared target of a $500m turnover in the coming years. Nikolic came to Minsk to launch the latest project of Dragomir and Bogoljub Karic, two Serbian brothers who have been implementing several investment deals in Belarus. The businessmen have undertaken the construction of multifunctional complex Minsk-Mir at an estimated cost of $3.5bn, having received undisclosed incentives from the Belarusian president. At the inauguration ceremony both presidents made public the surprising idea of gathering the presidents of the former Yugoslavian republics in Minsk in 2016 and involving these countries in the construction of Minsk-Mir. Nikolic also thanked Lukashenka for his continued support of Serbia’s territorial integrity. In fact, ten days earlier Belarus voted against admitting Kosovo to UNESCO. This initiative fell three votes short of being adopted. Azerbaijani President Ilham Aliyev came to Belarus on a one-day official visit on 28 November. As the trip took place only a few days after Turkey downed a Russian warplane, some analysts hurried to suggest that Belarus and Azerbaijan, both close to Russia and Turkey, arranged an express meeting to discuss possibilities for mediating the emerging conflict. However, these conclusions are groundless. The presidents of Belarus and Azerbaijan keep a regular schedule of yearly meetings. This time around they signed a number of important bilateral documents, which had been drafted well in advance, including an agreement on social and economic cooperation valid up to 2025. 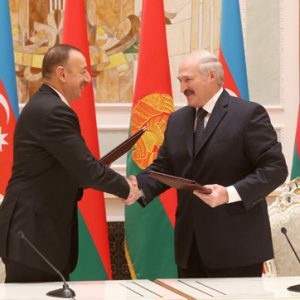 Lukashenka and Aliyev reiterated the strategic nature of their relationship. However, Azerbaijan fails to see Belarus as a strategic market for its goods. Bilateral trade is strongly one-directional. In 2014, Belarusian exports to Azerbaijan were worth $318m and its imports from Azerbaijan a mere $8.7m. Belarus is looking to further increase its exports and to attract Azerbaijani investments. Azerbaijan may be more interested in military-industrial and scientific cooperation and technology transfers. Both countries support each other in the international arena. Lukashenka made his first foreign trip following his re-election to Vietnam on 9 December. This was not an intentional tribute to the two countries’ strategic partnership. During his one day visit to Hanoi, Lukashenka met all the top leaders of the country. Belarus and Vietnam agreed to foster their bilateral ties in a wide range of areas, going well beyond the prioritised trade relationship. Vietnam has been seeking technology transfers and industrial cooperation with Belarus, particularly in the petrochemical industry, engineering, and automobile assembly. Reportedly, the Belarusian businessmen who accompanied Lukashenka on this trip signed contracts with their Vietnamese colleagues worth $350m. This is a huge amount taking into account the existing trade turnover (only $169.3m in 2014). Routinely, Belarus and Vietnam agreed to aim at a $500m turnover in the near future. The Belarusian president postponed his visit to Moscow, which was originally scheduled for 25 – 26 November. Belarus and Russia explained the postponement as a result of the extreme workload of both Lukashenka and Putin. However, a more plausible explanation is Belarus’ unwillingness to jeopardise its relations with Turkey by having to comment in Moscow on the warplane shoot-down incident. Another reason might be a lack of an agreement on the issue of a Russian air base in Belarus. On his way back to Minsk, Alexander Lukashenka made a stopover in Ashgabat on 10 – 12 December for an official visit and a celebration of the 20th anniversary of Turkmenistan’s neutrality. Bilateral turnover has been falling dramatically since 2013. It amounted to $67.7m in January- September 2015. As with Azerbaijan, it remains a one-way street with Belarusian exports largely dominating. The ‘flagship project' of the two countries’ economic relations remains the Garlyk mining and processing complex for potash fertilisers in Turkmenistan, which is being built by a Belarusian company. Turkmenistan is also one of the largest buyers of Belarusian MAZ trucks. Furthermore, Belarus has become a preferred destination for Turkmen students. Over 9,000 Turkmens have been studying in Belarusian universities. On his third day in Ashgabat, Lukashenka used a statement at an international conference dedicated to Turkmenistan’s neutrality to call for dialogue between Russia and Turkey. 'It is essential to find a solution, to make a concession. At least, a way to take a half-step towards each other should be found to de-escalate the tension', Lukashenka said. It is highly probable that Lukashenka met Turkish president Recep Tayyip Erdogan on the sidelines of the summit in Ashgabat. However, publicising such a meeting, if it indeed took place, would not be in Lukashenka’s best interests. Russian public would be unlikely to respond positively to its ally’s contacts with Russia’s sworn enemy. It is already unhappy with Belarus’ neutrality in this conflict. Lukashenka has been trying to capitalise on his good personal contacts with a number of foreign leaders, seeking investments and exports revenues for his currency-stripped county. It appears that he is not willing to engage in political liberalisation to gain access to the West’s much larger financial assistance and further decrease his dependence on Russia.